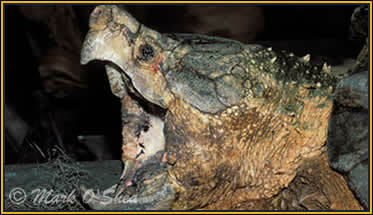 Location: The Alligator snapping turtle is not protected in the State of Louisiana. Louisiana is the only state within the range of the huge freshwater Alligator snapping turtle that does not afford it some legal protection. In southern Louisiana meat from the long-lived turtle is an important ingredient in Cajun cooking and the turtle is nearing extinction in the wild where it is being poached. Mark joins turtle hunter turned game-keeper Hayden Reno to search for snapping turtles in the Manchac Wildlife Management Area. Mark then travels to Black Bayou in northern Lousiana, where the Cayun tradition is less apparent, and works with alligator snapping turtle expert Brent Harrel. Brent sets nets to capture turtles alive so he can collect data on their life-history before releasing them again, but turtles are not the only creatures that enter the hoop nets !! 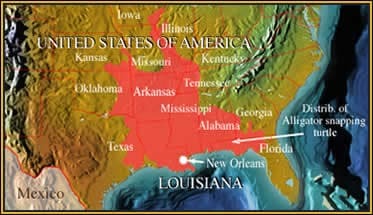 The Black Bayou site is a National Wildlife Refuge, owned by the U.S. Fish & Wildlife Service. As such it is a protected area and commercial trapping of turtles is illegal. A close view of the huge but endangered Alligator snapping turtle (Macroclemys temminckii), note the pink lure on its tongue.